For any bride-to-be, deciding on her wedding flowers can be exciting but also a big challenge. 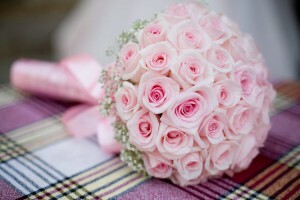 There are hundreds of flowers to choose from making it feel overwhelming, which is why many brides consult a florist. A florist can help you by advising you when choosing your floral arrangements. But before you book an appointment with your florist, there are three things you must do. Having your dress already picked out is a great starting point in selecting your flowers. The style, fabric, and colour of your dress will influence your flower choice. You want both the dress and flowers to complement one another, not clash with each other. Whatever style your dress is, a bouquet should never take away from your wedding dress. The shape and style of your dress must be well balanced. You should also come up with your colour scheme for two reasons: integration and availability. The colour of your theme can dictate what flowers would integrate well with your wedding colours. Deciding this will also narrow down what flowers of a particular colour is available. Some flowers are only available during certain seasons. Perhaps you’re having a summer wedding and would like to include pink camellias in your bouquet. However, these flowers are in season during the winter. Although they may be available, they can be quite expensive out of season. Before you start interviewing, you must plan out your budget so the florist can show you what your options are. The budget should cover the bride and bridesmaids’ bouquet, the boutonnieres, along with the arrangements. The cost can quickly add up. How much you spend can depend on a few things: flower availability, the complexity of your arrangements, and where will the flowers be shipped from. The type and style of your floral arrangement can greatly affect the price. A posy bouquet will be significantly cheaper than a cascading bouquet as there is often more work involved with the latter. Although you may want to include your favorite flower , it could also be the most expensive and difficult type of flower to get in the season of your wedding. 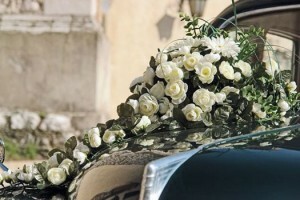 After deciding on your dress, colours, and budget is when you should consult a florist. They will be able to show you what flowers will be in season during your wedding. They can also tell you what flowers will match your dress and colour scheme. Arranging flowers can take some time and planning, so if it’s possible, try to set up your appointment around six months before the wedding date. Rather than walking in, call ahead to make an appointment. This gives the florist time to prepare and ensure they can sit down to discuss your desires. Be straightforward about your budget with your florist. From there, your florist can help you pick the very best flowers you can afford. 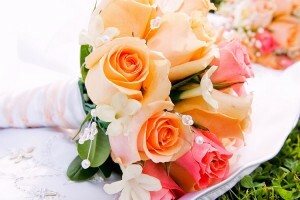 Look through wedding magazines and find bouquets you love to show to your florist. But also include things you don’t like. This will give your florist an exact idea of your likes and dislikes. Showing the florist your dress is perhaps the most important part. This will help determine the style of the bouquet that wouldn’t take away from the dress. 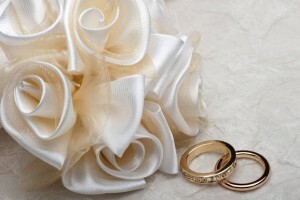 If you can, bring in a piece of the fabric from your wedding dress and the bridesmaids’ dresses. 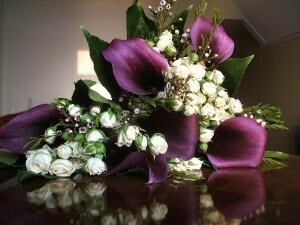 This will help the florist recommend the type of flower that would work best with the style and colour. Picking out flowers for your wedding can be a challenge, but consulting a florist will make the process easy. If you have picked out your dress, colour scheme, and made your budget, you are ready to seek the help of a florist to help pick out your wedding floral arrangements.